NVIDIA isn't letting down its guard. One month after the company brought Nougat and plenty of new features in an OTA update to its just-released SHIELD TV and a couple of weeks after it did the same for the original 2015 SHIELD TV, it's back with more updates and enhancements for these two Android TV set-top boxes. 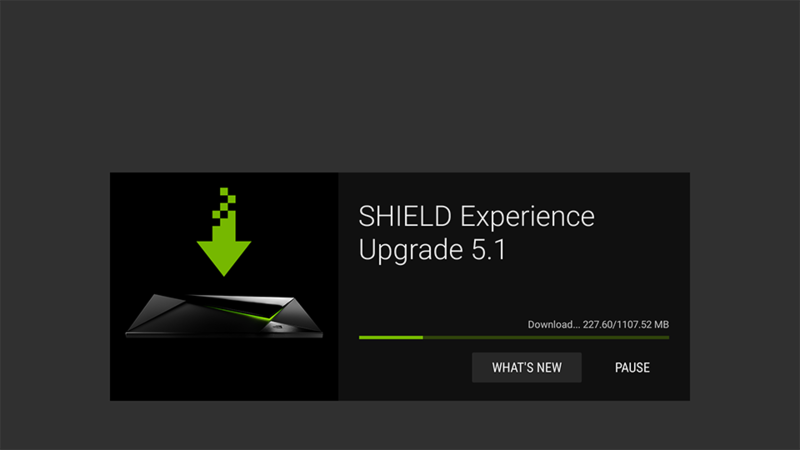 Both the old 2015 and new 2017 SHIELD TVs are getting updated from Experience Upgrade 5.0.2 to 5.1. This new version has a few new games — Deus Ex Human Evolution, Just Cause 2, and Diluvion — and a couple of enhancements like Amazon Video's surround sound. 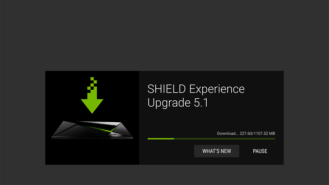 The update should be available to you starting today, so check your SHIELD TV for it and be patient if it hasn't rolled out to you yet. It might take a while to reach everyone. 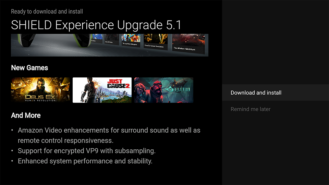 With the release of the new NVIDIA SHIELD TV, the new SHIELD controller was already making waves with the new rumble support while streaming games with NVIDIA GameStream. 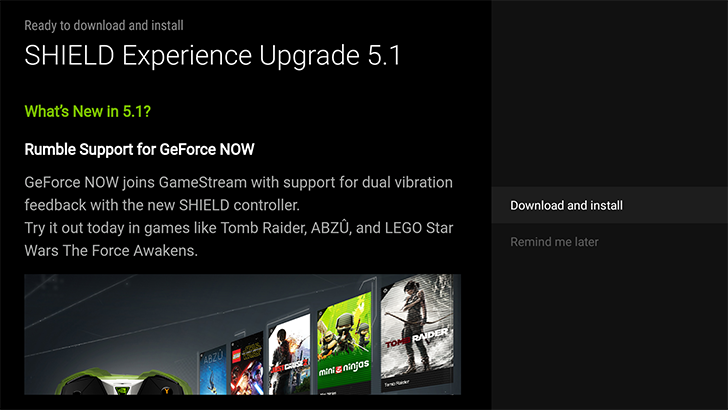 Today, we’re excited to announce support for vibration and haptic feedback while playing select GeForce NOW titles*. 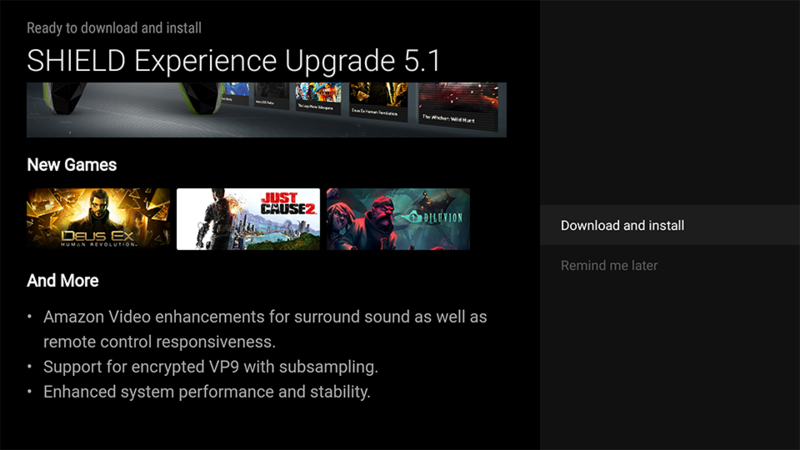 A whole host of games in the GeForce NOW library already support the rumble feedback feature. We encourage SHIELD fans to jump in and try it out on games such as Tomb Raider, ABZÛ, and LEGO Star Wars The Force Awakens. What Exactly is Haptic Technology? The term “haptic” is derived from the Greek word "haptesthai," which simply put means, “to touch.” In video games it has long been a staple in a variety of genres from racing games and shooters to fighting games. Often referred to as “Force Feedback,” haptics simply provide gamers with tactile sensations that serve to better immerse players in their games. In racing games it serves to help gamers have a better feel for the road. In fighting games and shooters, it’s yet another way to let the gamer know that they’re being struck by an enemy or to provide environmental cues. Below is a list of all of the GeForce NOW games that have been tested and are verified to support the new feature. That said, many other games in the GeForce NOW library may also support rumble. So try something new or revisit a past favorite to see which ones really move you! If you find a game that’s not listed here that supports the feature, by all means let us know. If you don’t already own one, pick up an NVIDIA SHIELD TV today. And for all our early adopters of SHIELD (2015) should you want give haptics gaming a try, the new SHIELD controller is available as a separate add-on accessory, compatible with the original device. *The new SHIELD controller is required to experience vibration feedback. SHIELD controller (2015) does not support vibration feedback on SHIELD TV.